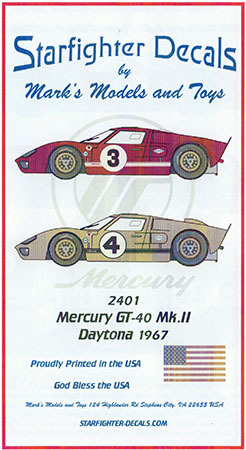 Starfighter Decals has released their first decal set in 1/24 scale, this one covering two GT-40 racers. As you can see in the photos, the decals are included for both cars, though you may need extra sponsor markings to render both cars from this set. You can purchase these decals directly from Starfighter Decals on their website.